The keynote event for Toms River’s first NEA Big Read will take place this Thursday Oct. 26, from 7-9 p.m. at the Jay and Linda Grunin Center for the Arts at Ocean County College. 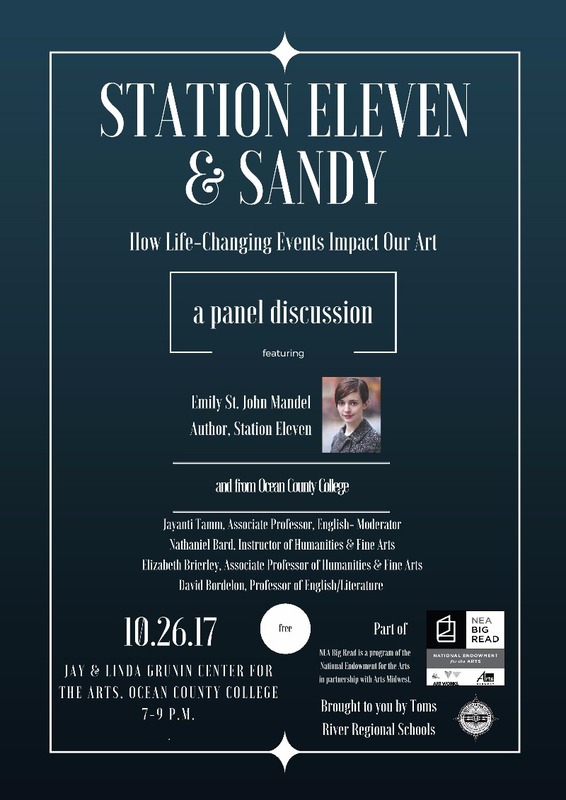 “Station Eleven & Sandy: How Life-Changing Events Impact Our Art” will include a panel discussion from four OCC professors, as well as an appearance and speaking engagement from Emily St. John Mandel, the author of the best-selling novel Station Eleven. Toms River Regional Schools was awarded a grant from the National Endowment for the Arts and Arts Midwest to host NEA Big Read this school year, a literacy program designed to have an entire community read one book. The district selected the popular contemporary novel Station Eleven as its reading selection. The post-apocalyptic story contains many themes that connect specifically to Toms River and its schools, including art, media, and instances that draw comparisons to life during and after Superstorm Sandy. NEA Big Read has been taking place throughout October, a month chosen to host the program because it marks the five-year anniversary of Sandy. The event is free and open to the public. Those who wish to reserve a seat in advance can do so here. The event will begin with a 45-minute panel discussion featuring four Ocean County College professors, each with knowledge of Station Eleven and specializations in fine arts, English, and humanities. At 8 p.m., Emily St. John Mandel—who will be introduced by a Toms River student—will speak for half an hour about the novel, the process of writing it and the research that went into it. The audience will be transported into the pages of the spellbinding novel as she discusses notes on the end of the world, the history of pandemics, the impact of the bubonic plague on Shakespeare’s life and work, and how she perceives the connection of Sandy to the circumstances presented in the book. The author will then join the panel for the final half hour to advance the discussion, one which will feature audience interaction. An exclusive meet-and-greet with the author will take place prior to the event from 6-6:30 p.m. during which time Emily St. John Mandel will meet fans and sign copies of her novel. The participants of this special pre-event include students, parents, and residents who have earned or won the chance to meet the author during other Big Read events throughout the month. Eleven Toms River residents, for example, earned "golden tickets" to meet the author after finding copies of Station Eleven hidden throughout the community, a project developed by the popular Toms River Rocks. Those interested in attending “Station Eleven & Sandy: How Life-Changing Events Impact Our Art” are encouraged to reserve a space, as seating is limited for the free event. Anyone with questions or seeking more details may contact district grant writer Mike Kenny at mkenny@trschools.com or 732-505-5539.